* Urethral catheter. 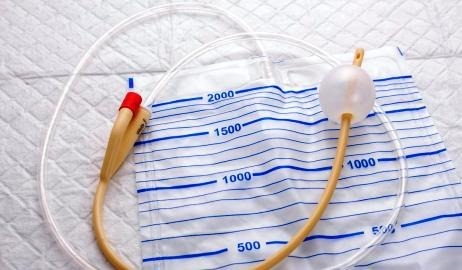 Also called a Foley catheter, the healthcare provider inserts this type through a person's urethra. * Suprapubic catheter. A doctor will surgically insert the suprapubic catheter through a small hole a few inches below the belly button. This operation will take place in the hospital while the person is under a local or a light general anesthetic. It is important to empty a drainage bag before it becomes full. For most people, this will mean emptying the bag every 2-4 hours. A person should also attach a clean, unused drainage bag twice per day and attach a larger bag at night. Symptoms of a CAUTI can include a high temperature. 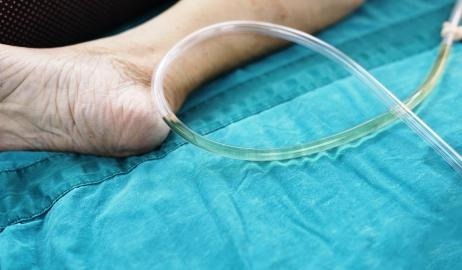 The main disadvantage of using a catheter is that it can allow certain bacteria to enter the body and cause infection.